With the S332D offered by BRL Test you are on the site and in control. Move with freedom, see with clarity and act with certainty. Fix the fault and be the hero of the site. Do you have what it takes to master the site? With the S332D offered by BRL Test you are on the site and in control. Move with freedom, see with clarity and act with certainty. Fix the fault and be the hero of the site. Be the budget hero when you buy premium used, certified and warrantied from BRL Test. Fully backed by BRL Test’s world class repair department. BRL Test...We Absolutely Know SiteMasters. The AB-900 is a linearly polarized broadband Biconical antenna specifi cally designed for EMC testing. It has a frequency range of 30- 300 MHz. This antenna can be used for both emissions and immunity testing. For immunity testing, the AB-900 antenna has a balun that is capable of accepting up to 50 Watts at its input terminals to generate electromagnetic fi elds. These antennas are individually calibrated using procedures described in ANSI 63.4. The calibration data is shipped with the antenna to maximize measurement accuracy. Both antenna models have the same mounting base, with a 1/4 inch x 20 threaded hole. It can be mounted on a Com-Power AT-100 tripod or any other antenna tripod with matching threads. Application Biconical antennas are used for emissions and immunity testing to meet various EMC standards specifi ed by FCC, CISPR and EN. The broadband characteristics of the biconical antenna make it a good choice for making sweep measurements and for automated measurement systems. Normally, tuned dipole antennas are used for EMC site attenuation measurements for better accuracy. However, the biconical antenna is easier to use for vertical site attenuation measurements, because of the long dipole element lengths at lower frequencies (5 meters at 30 MHz). According to ANSI 63.4 specifi cation, a calibrated biconical and a log periodic antenna can be used for site attenuation measurements. The calibration data provided with each antenna is used to calculate fi eld strength measured for the selected frequency. The antenna factor (dB/m) for the selected frequency is added to the measured output (dBV) displayed by the EMI meter to obtain fi eld strength (dBV/m). N9340A / TG3 Handheld Spectrum Analyzer at BRL Test. Click here for datasheet and quote form at BRLTest.com. On the go and in control now! The N9340A is portable, accurate, easy, fast and quiet. Be the onsite hero who finds the elusive problems quickly. Be the office hero who saves the budget with premium used, certified and warrantied equipment that is fully backed by BRL Test’s World Class Repair Lab. Arlington, VA — According to the Consumer Electronics Association (CEA), the Recommended Practice for the Installation of Smart Grid Devices, CEA/CEDIA-CEB29, has been added to the Smart Grid Interoperability Panel’s Catalog of Standards. Today’s homes include many products that connect to each other over a variety of networks, and to operate reliably, both the products and the wiring to which they connect must be well protected and installed according to the manufacturer’s instructions. 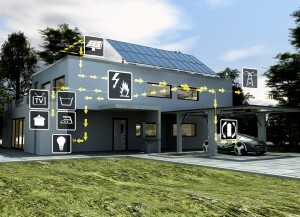 While CEB29 was written as a recommended practice for the installation of communicating smart grid devices in the home, all communicating products — including home controls, AV, HVAC, computers and appliances — are connected to the same electrical wiring and networks, and face the same installation challenges. To remedy this, CEB29 combines information from many sources into a simple, accessible format that assumes no prior knowledge of the subject matter. CEB29 includes the most important installation requirements and recommendations from the National Electric Code (NEC), UL, wiring standards and other expert sources covering a wide range of subjects including the proper installation of high- and low-voltage wiring, grounding, lightning and surge protection, and many of the installation problems encountered by today’s wired, wireless and power-line carrier networks. To order a copy of CEA/CEDIA-CEB29, call TechStreet 800-699-9277 or 734-780-8000, or visit techstreet.com/publishers/285894 to order online. CEA leads technology manufacturers in fostering CE industry growth by developing industry standards and technical specifications that enable new products to come to market and encourage interoperability with existing devices. CEA’s Technology & Standards program maintains an unmatched reputation as an effective and flexible standards-making body accredited by the American National Standards Institute (ANSI). For more information on Technology and Standards at CEA and how to get involved, please visit http://www.CE.org/standards. The SGIP Catalog of Standards serves as a compendium of standards, practices, and guidelines considered relevant for the development and deployment of a robust and interoperable Smart Grid. The Energy Independence and Security Act of 2007 directed the National Institute of Science and Technology (NIST) in 2009 to form the Smart Grid Interoperability Panel (SGIP) as a public-private partnership. SGIP was charged to coordinate standards work to ensure interoperability and security as the grid is modernized. In 2012 the SGIP transitioned to SGIP 2.0, Inc., a member-funded organization that carried forth its predecessor’s original mission. Tektronix DSA72504D. Be sure with excellent signal integrity. Click here for datasheet and quoteform. The superior signal integrity and excellent signal-to-noise ratio of the DPO/DSA/MSO70000 Series ensures confidence in your measurement results. High bandwidth, up to 33 GHz, matched across 4 channels Bandwidth enhancement eliminates imperfections in frequency response all the way to the probe tip. User-selectable filters for each channel provides magnitude and phase correction for more accurate representation of extremely fast signals. In addition, only Tektronix allows the user to disable the bandwidth enhancement for applications needing the highest measurement throughput Simultaneous high sample rate on all channels captures more signal details (transients, imperfections, fast edges) 100 GS/s on 2 channels and 50 GS/s on all analog channels for the 12.5 through 33 GHz models 25 GS/s on all analog channels for the 4, 6, and 8 GHz models 12.5 GS/s on all logic channels in the MSO70000 Series Lowest jitter noise floor and highest vertical accuracy provide additional margin in your measurements Long record length provides high resolution and extended-duration waveform capture Standard 10 MS per channel on the DPO70000 and MSO70000 Series and 31 MS on the DSA70000 Series Optional up to 125 MS on all four channels for the 4, 6, and 8 GHz models Optional up to 250 MS on all four channels for the 12.5 through 33 GHz models On the MSO70000 Series, the record length of logic channels matches the analog record lengths for uncompromised analog and digital acquisition MultiView Zoom helps you manage long records, compare and analyze multiple waveform segments With high signal-to-noise ratio and low internal noise floor, the DPO/DSA/MSO70000 Series enable you to perform precise characterization measurements. When debugging a DUT, a low noise floor and maximum signal fidelity of the measurement instrument allows you to find the smallest anomalies affecting the DUT’s performance. For RF signals, a lower noise floor translates into a higher dynamic range, opening the DPO/DSA/MSO70000 Series to a wider range of applications Widest Range of Probing Solutions – Whether you need to measure 8 Gb/s serial data, fast digital logic, or switching currents from your new power supply design, Tektronix offers a vast array of probing solutions, including active single-ended, differential, logic, high voltage, current, optical, and a wide range of probe and oscilloscope accessories.